We all love our to-do lists – both making them, and the satisfaction of checking items off, one-by-one. Here’s a shopping list to have on hand when you’re updating your fall wardrobe: timeless jewelry pieces every woman should own. Like the Little Black Dress is for your wardrobe, these basic pieces are must-haves in your jewelry box. 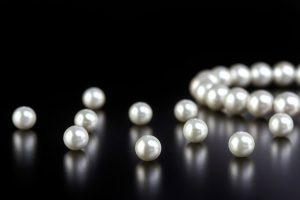 Pearls: Audrey Hepburn, a.k.a Holly Golightly, would never leave home without them, and neither should you. Whether it’s a bracelet, earrings or classic necklace, pearls can lend a chic touch to any ensemble. Tank Watch by Cartier: It recently celebrated its 100th anniversary and was a go-to piece for the likes of Lady Diana, Jacqueline Kennedy and even Truman Capote. Jeweler extraordinaire Louis Cartier was inspired by the shape of a military tank combined with cubist lines. Cocktail Ring: This bauble makes a statement – an oversized stone mounted on an equally-large setting. It first appeared in the Roaring ‘20s and became fashionable post-World War I. Ironically, it was a reaction to Prohibition: an intentional, luxurious quirk that flappers wore to get noticed at speakeasy parties. Chain Necklace: While it may look like a modern jewelry “classic,” this bold, designer necklace turned jewelry trends in the ’60s on their heads. Think Pomellato which introduced it fifty years ago with its metallic, industrial look. Zero1: This ring band by Bulgari’s ring combines two distinctive elements, the Tubogas motif (think ’70s) and the “BVLGARI BVLGARI” double logo. Over the years the ring has come in numerous variations and features materials ranging from gold to diamonds to even ceramics, rendering a timeless vibe. Tiffany Bracelet: A major piece of Americana, it combines the famous brand on Broadway with the dream of women worldwide. The best-selling jewelry piece of all time, the Tiffany silver bracelet became the token of love to bestow, and remains a popular choice for Valentine’s Day or a special anniversary. Animal-Shaped Brooch: Choose the animal you like or that best represents you, just make it high-end (i.e. the pins from Van Cleef & Arpels.) The brooches are easily wearable – use them to hold a collar in place, dress up a lapel or headscarf or even embellish a belt. Stud Earrings: This basic piece is the answer to many a fashion dilemma. Choice of the cut is key for these small, luminous diamonds, as it can enhance their brilliance. Loop Earrings: Whether they’re mini or medium-sized, they are a must-have in gold or platinum, and perfect for every-day wear. You can thank Cher and Madonna for the introduction of these pop culture icons. F. Silverman Jewelers has been outfitting scores of men and women in the Bergen County, New Jersey area with timeless treasures for more than 20 years. We feature pieces from top jewelry designers, as well as offering incomparable custom work and jewelry repair. Visit us to today and make an investment in wearable art that will never lose its value.